As educators, we often find ourselves in the uncomfortable position of trying to explain why students don’t seem to have learned what we know we’ve taught them. Economics instructors ask math instructors, “How come these students who have taken College Algebra still don’t understand slope?” Science teachers ask English instructors, “How come students still don’t understand basic grammar rules when they write in my science class?” The key here is to understand that students aren’t learning skills in a way that helps them to transfer the skills to new situations – the learners have compartmentalized the skill to a particular domain and it doesn’t get sufficient escape velocity due to lack of random or varied practice. In sports, there has been some eloquent research showing that random practice leads to more transferrable and long-lasting skills than blocked practice. It’s worth taking a short dive into this research area. The gains shown in blocked practice erode when we look at longer timelines. Random practice provides short-term gains AND holds up in the long-term. 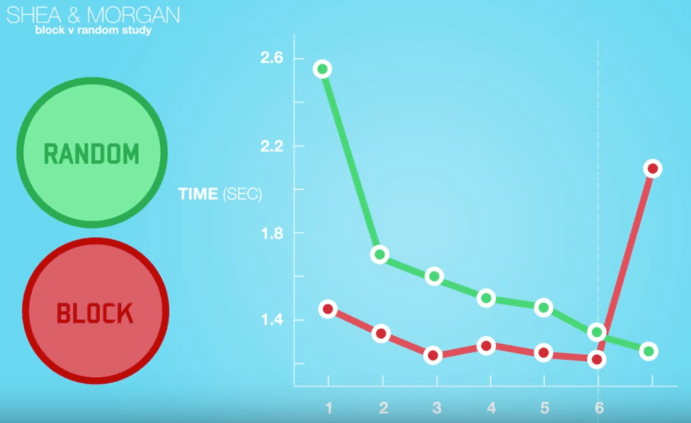 Watch the 16-min video “Motor Learning: Blocked vs Random Practice” by Trevor Ragan. He does a lovely job of walking through some of the motor learning research that very eloquently shows that “random practice” is more effective for transference and long-term retention than “blocked practice.” This is basically the same concept as massed vs varied practice discussed in cognitive science. Shea, J. B., & Morgan, R. L. (1979). Contextual interference effects on the acquisition, retention, and transfer of a motor skill. Journal of Experimental Psychology: Human Learning and Memory, 5(2), 179. Hall, K. G., Domingues, D. A., & Cavazos, R. (1994). Contextual interference effects with skilled baseball players. Perceptual and motor skills, 78(3), 835-841. In education we are really good at having students practice the “Do” of the “Read, Play, Do” process that Ragan describes in the video. “Do” skills are orderly and easy to monitor and assess. How can we shift to the messier strategy of having students practice all three parts of the process? For students you teach, what is the equivalent to practicing basketball shots from a variety of distances with different blockers around them? Weekly Teaching Challenge: Consider all the topics you teach next week and design one new activity that focuses on “random” practice instead of “blocked” practice. If you’d like the weekly teaching challenge delivered to your inbox each Friday, sign up to receive the Challenge here.